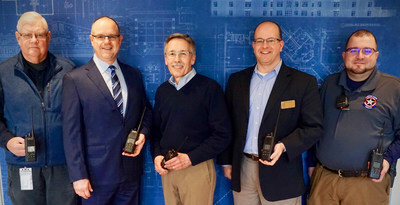 JVCKENWOOD donated ten (10) KENWOOD Viking VP5000 portable radios to Hamilton Southeastern School District. The radios will be used by the District's safety personnel to ensure that the officers are equipped with public safety grade communication equipment. Hamilton Southeastern Schools serves more than 21,500 students across 21 K-12 buildings. Establishing a direct line of communication between our administration team and school personnel helps us ensure the safety of our students. When an emergency situation occurs, every second counts, and knowing what is happening in real time allows us to better direct priorities and resources," says Superintendent Dr. Allen Bourff of Hamilton Southeastern Schools. "The donation of the two-way radios from JVCKENWOOD will be put to immediate use and allow our district to maintain consistent, effective and coordinated communications to help keep our schools safe."